For those who like to indulge wanderlust with fiction, Here Where the Sunbeams Are Green is a real treat. Set in the jungles of Central America, the descriptions are as lush and verdant as the landscape being described. Phillips captures both the beauty and the danger inherent in such a setting, from the poisonous bright-colored tree frogs to the daily monsoon-like rains. The descriptions bring this Central American jungle to life. Using this setting, Phillips conveys important messages about modern society's treatment of the environment and extinction of natural species. In Here Where the Sunbeams Are Green, the two young heroines and Kyle, a new (cute) friend, team up to save a species of bird, the Lava-Throated Volcano Trogon, from final extinction. A Lazarus species, the LTVTs were already thought extinct once, but now they are being hunted to death for sinister purposes, and, for some reason, their father, a bird expert and lover, is involved. Phillips manages to get her environmental messages across organically, without any preaching. My very favorite aspect of the story is the dose of magical realism that Helen Phillips added into the mix. La Lava, the plush resort Madeline and Ruby's father works for, is located next to an active volcano, one not believed to blow for another hundred years. However, this volcano's explosive tendencies correlate with the health of the LTVTs. If they die out, the volcano will explode. There are also these giant flowers that can be used as umbrellas if you push the right spot, and glowing mushrooms. These little magical touches really brought the story to life, adding a cinematic touch that middle graders will love. Mad makes a rather unique heroine. 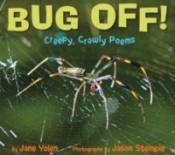 Middle grade MCs tend to be funny and plucky kids, adventurous and brave. Mad, on the other hand, fears pretty much everything and envies the confidence and talents of her younger sister. Mad's jealousy of Roo does wear a bit thin, but I was so happy when Mad finally realized her own strengths. Roo does seem a little bit too magical and clever, though, so Mad's inferiority complex does make a bit of sense. For example, Roo picks up Spanish in just a couple days. The plot follows pretty standard middle grade lines. Ruby and Mad's parents, while ordinarily loving and pleasant, have been made to act not like themselves. To restore their parents, Roo and Mad have to complete a quest, using ingenuity and determination. Along the way, Roo has a first crush. It's all very cute and empowering, if not anything out of the ordinary. Helen Phillips transports you to another place and takes you on a journey through the jungles. 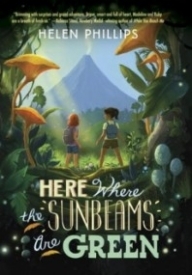 Her skill at description and timely message make Here Where the Sunbeams Are Green a wonderful choice for middle grade readers (and older ones too).